As a unique advantage, individual power outputs of NETIO 4 smart socket devices can be controlled over LAN/WiFi with a wide range of network protocols. Each 230V socket can be switched on or off, toggled, or power-cycled with a defined pulse duration. The remote control protocols are called the M2M (Machine to Machine) API (Application Programming Interface). NETIO 4 can be connected to a LAN via Ethernet (RJ45) or WiFi. The smart PDU (Power Distribution Unit) can also work as a WiFi AP (Access Point) to connect to a LAN via WiFi. NETIO 4 includes a fixed WiFi antenna. NETIO smart sockets and PDUs support a wide range of protocols for connecting to various applications and devices over the network. A simple system for switching individual sockets on/off by accessing a URL. IT and Telco infrastructure management protocol. Version 3 features enhanced security. Text files in the XML format transferred over HTTP or HTTPs. Simple industrial M2M protocol for controlling NETIO 4 smart sockets from various PLCs, SCADA systems etc. Text files in the JSON format transferred over HTTP or HTTPs. Protocol for IoT (Internet of Things) cloud applications. NETIO 4 smart sockets maintain a connection to the cloud application that can control them. Simple command-based protocol over a TCP connection. The communication can be secured using SSL. This protocol is backwards-compatible with NETIO 230B. Telephony protocol; sockets can be controlled using an IP telephone in a way similar to opening doors. I forgot my password. How can I reset NETIO 4 to factory settings? If you forget your password, it is possible to manually reset the device to factory defaults. This is done by pressing and holding outlet buttons 1 and 2 when starting the device via power switch. Hold the buttons until the device beeps 3 times. During the resetting process, all the outlet LED are blinking red. As soon as reset is completed, the device beeps 3 times. Whole procedure takes about 2 minutes. Factory default is done by pressing and holding outlet buttons 1 and 2 when starting the device via power switch. Hold the buttons until the device beeps 2 times. During the resetting process, all the outlet LED are blinking red. As soon as reset is completed, the device beeps 2 times. I forgot my password. How can I reset NETIO 4All to factory settings? Is it possible to control NETIO 4x outputs with a mobile app? Yes, use the NETIO Mobile app. The mobile phone and all controlled devices must be in the same network. The app supports NETIO 4/4C/4All and can control multiple devices. 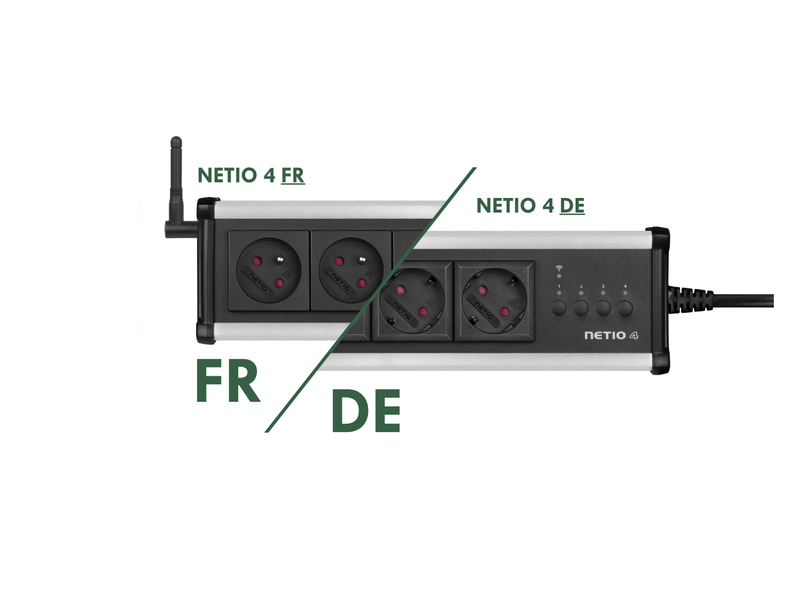 NETIO 4All is a PDU module featuring four 230V/8A power sockets with consumption metering for each socket as well as LAN and WiFi connectivity. Each of the four sockets can be individually switched on/off over the Web or using various M2M API protocols. A metal bracket to fasten one NETIO 4 or NETIO 4All device to a vertical bar in a rack frame.